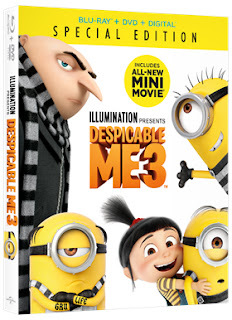 This contest is just in time for the holiday season, Thisfunktional is going to be giving away some copies of "Despicable Me 3." The movie comes out on Nov. 21 on Digital HD and Dec. 5 on 4K Ultra HD Blu-ray, Blu-ray, DVD and on Demand. I will be making sure a few Thisfunktional readers will be enjoying the Holidays with Gru and his family. Disclaimer: Winners will be chosen. Contest runs to Dec. 1, 2017 midnight. No purchase necessary. Prize provided by H+M Communications. Only open to the U.S., no PO Boxes or international addresses. Only one entry per household. Entries on behalf of another person will not be accepted and joint submissions are not allowed. We will not accept entries of contestants who have claimed a prize in the last 6 months. SPECIAL EDITION FEATURING AN ALL-NEW MINI-MOVIE, MINION MOMENTS & MORE. Illumination and Universal Pictures Home Entertainment present "Despicable Me 3" on Digital and Digital 3D November 21 and on 4K Ultra HD, Blu-ray™, DVD and On Demand December 5. The characters beloved by everyone – Gru, his wife Lucy, their three adorable daughters—Margo, Edith and Agnes—and the Minions provide hours of family fun in this heartwarmingly subversive comedy from Academy Award®-nominated producer Chris Meledandri (Despicable MeFranchise) and directors Pierre Coffin (Despicable Me Franchise) and Kyle Balda (Minions 1 & 2, The Lorax). Hailed as “the best Despicable Me movie yet,” by Ali Plumb of BBC Radio 1, with over $949 million in global ticket sales, "Despicable Me 3" is the ultimate holiday gift, with almost an entire hour of exclusive bonus features including an all-new mini-movie, a never-before-released deleted scene, and much more. Illumination, the studio that brought you "Sing," "The Secret Life of Pets" and the "Despicable Me" franchise, continues the adventures of Gru and his family in "Despicable Me 3." After he is fired from the Anti-Villain League for failing to take down Balthazar Bratt (Trey Parker, “South Park,” Team America: World Police), the latest evil mastermind to threaten humanity, Gru finds himself in the midst of a major identity crisis. But when a mysterious stranger shows up to inform Gru that he has a long-lost twin brother — a brother who desperately wishes to follow in his twin’s despicable footsteps — the former super-villain rediscovers just how good it feels to be bad. Academy Award® nominee Steve Carell (Foxcatcher) reprises his hilarious role as reformed criminal mastermind Gru, as well as his newly discovered twin, Dru. The all-star voice cast also features Kristen Wiig (Bridesmaids, Despicable Me 2), Miranda Cosgrove (Despicable Me 1 & 2, School of Rock), Steve Coogan (The Secret Life of Pets, Philomena), Jenny Slate (Zootopia, The Secret Life of Pets), Dana Gaier (Despicable Me 1 & 2) and legendary singer and actress Julie Andrews (The Sound of Music, Mary Poppins).